I’m gathering a tribe of channels. I am taking this course right now, and I have to say it is just fantastic. Truly a wonderful program. Learn a simple step by step process to connect with and channel your guide. Would you like guidance for life? From A cosmic cheerleader who only had your best interests at heart? A being who offered you the highest and most expansive insights and support for your life? Would you like to never have to feel alone again? Would you like a direct line to divine intelligence, to dial home? You can and I can show you how. Channeling allows you to experience the unconditional love available from Source in a truly profound way. By developing your channeling skills, you’ll be able to access all the support you will ever need. Its sacred but not serious. I’ll tell you a secret……..allowing yourself to feel all the love available from your guide will be your greatest challenge. I’ve been a messenger for spirit and the non-physical since I was 17 years old and not adverse to the odd cosmic experience but energetically blending with a guide was completely different and a life changer for me. I’d love to introduce you to that powerful process. I connected with my guide, Aurora, spontaneously one evening. It was not something that I had consciously planned to do, and whilst it was an incredible experience, once I’d come out of the channeling state, all my fears and doubts surfaced and I really struggled to believe that it was that easy and that I was good enough to do it. Is my voice was going to change in front of my then new partner? That’s so embarrassing! Will I channel for the “dark side”? When is it OK to do readings? How can I trust this guidance? What/who else can I channel? Am I opening myself up to psychic attack? and I’d been working with guides and giving readings since I was 22! Thankfully I had a very grounded partner who was very excited about channeling, another professional channel who was kind enough to share his own journey with me and a very grounded Pagan friend who had no fear of “the darkness”. Without their support my journey into channeling would have been very different. Without support, I may have abandoned the idea altogether and that would have been a great shame because channeling Aurora has changed my life. Life is a richer experience altogether… I’ve always believed in magic, but now I get to see it in action! Channeling is like playing as a child in a cosmic playground. You can experience yourself as a non physical being, communicate with other non physical beings and generally have the best party you could imagine. Have a cheerleader for your Soul’s goals. Gain additional tools for your spiritual tool kit. Receiving guidance about your life, your next steps, your purpose, THAT relationship 😉 is just the tip of the iceberg, so much more richness is available when you consciously merge your energy with a being of Love who desires to be your guide. So then gorgeous, how is this all going to work for you? Well, the online program has a structure that allows you to work at your own pace. Integrating new energy into your system works at different speeds for different people this programme allows for that and gives you an optimal experience. There are six modules plus bonuses. You can either do a module per week or have a weekend fest. It’s completely up to you. The course is also set up so that you can repeat each module as you want to deepen your channeling practice or desire a new guide! I just want you to know that you have given me one of the greatest gifts of my life Cara. Thank you for Holding the space, making it feel natural and fun to connect and verbally channel my guides and giving me the confidence to know I can do it alone and for others. And I know with more practice and trust I will have guidance for life. Discover how to invite and connect with the highest possible guide for you and why it’s important that you partner with the creme de la creme. Meet your guide (eek! squeal, handclap and pogo dance alert) and learn how to be super confident this is the right guide for you, that you can trust this guide. Merge your energy system with that of your guides and verbally channel or learn other forms of channeling. Take your guide out on the road. Practical ways of partnering with your guide in day to day life without having to speak as your guide in the supermarket! (Although you can if you want). Think of it as silent channeling or I think of it as having Aurora on my shoulder. Learn Aurora’s fool proof process for having a strong connection to your guide and learn how to really trust that information is coming from your guide. Want to know about Aurora? They guide who you are going to be working with? Good plan! 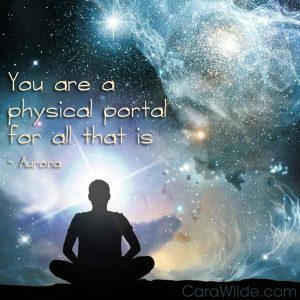 Listen to this audio clip of Aurora talking about why they are here. You want to deepen your service to Source. You don’t need to have a history of cosmic experiences for channeling to work, just a curiosity and willingness to play. I had the pleasure of knowing Cara and Aurora before taking the actual programme. I signed up due to the fact I had high expectations, in that Cara is one of the most down-to-Earth yet knowledgeable people I know. The channel your guide course surpassed my expectations. I actually look forward to the moments I can play with it. If you want to experience pure conscious cosmic connection then this is absolutely the resource for you. Please note this price has been reduced from £247 to £97 as it no longer includes the live facebook support group. This is a self study program. You don’t believe in guides or consider yourself to be a healthy skeptic. This course doesn’t try and convince you of the existence of guides or non physical reality. You are experiencing chronic depression or severe mental health issues. The most enjoyable and effective time to access this course is when your life is feeling pretty stable. If you need further clarification about this, please contact the course support team here. Working with Cara and Aurora has been a life changing experience for me. When Aurora took me into a meditation and showed me how to connect with my guide on a deeper level than I had ever experienced before, the pure joy and emotion I felt during and after this connection was immense, and such a warm and liberating experience that stayed with me for days. From that point my life changed completely. I was more in touch with who I was, what I wanted and how I was going to achieve that. Things were clear and as though my life had switched from analog to HD even the sky and the grass seemed brighter, sounds were sharper and I felt alive and without fear as though anything was possible. I remember connecting with my guide on a regular basis after that and the surge of love I felt and still feel now even if I haven’t consciously connected to her filled my heart with joy and love and peace it is a very peaceful experience and my worries disappear and I always feel the connection in my heart centre this is when I know I am connected with my guide and my true self and source energy. I would recommend anyone who is wanting to discover themselves and their inner strength and discover what possibilities are open to them to work with cara and aurora they will help you to become the best you can be to be a better person then you ever thought possible and achieve things that seem near impossible for you to achieve. There are no limits in our life and with Cara and auroras coaching you can discover that life really is open to all possibilities and how abundant the world really is. Yes, I want to channel my guide!